Hon. 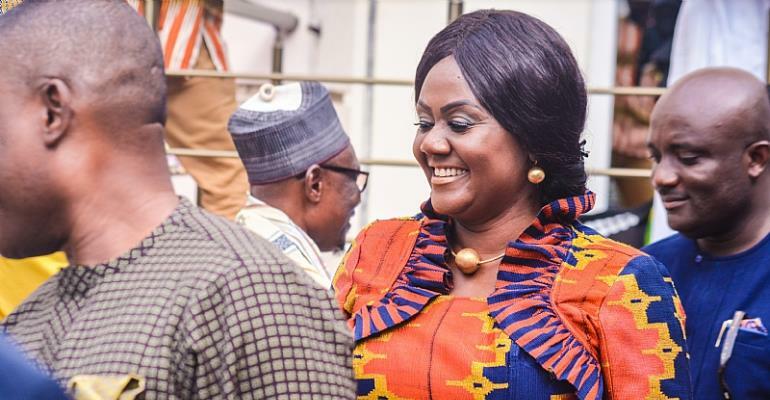 Lawyer Mrs. Barbara Oteng-Gyasi, Minister of Tourism, culture and creative arts designate, on Friday, 15th March, 2019 went through Parliamentary Appointment Committee Vetting as required by the Constitution of Ghana prior to being appointed as a Minister of State. The Minister designates who is also the Member of Parliament for Prestea/Huni-valley constituency answered questions and expressed her thoughts relating to her Curriculum Vitae, life experiences, issues bothering on several aspects of Tourism in Ghana as well as her plans and programmes to transform the industry when given the nod. Answering to the Member of Parliament for Tamale North Hon. Alhassan Suhuyini's question on what she will do to save Ghana’s interest about the accountability situation of the controversial AFRIMA Awards as players in the industry are not satisfied with the level on transparency even as they disagree with the decision of the former minister Catherine Afeku to invest GH₵4.5M into hosting the Awards which was initiated by a group of Nigerians, Mrs. Oteng-Gyasi said, she is aware that Ghana got the right to host the AFRIMA for 3years of which the first year has been done and so there is a chance to review the first. The minister designate said, although the industry in Ghana faces major challenges such as infrastructure and revenue mobilization, tourism has immense potential to drive the economy, contribute to the GDP and foreign exchange earnings of the country if the country can leverage on its mineral resources, unique culture and traditions we can derive lots of benefits and revenue from it. She later joined Elvaco as well as Ansah Asare law firm She then moved on to become the legal officer at the Unilever Ghana limited and later transferred to head the legal department at GTP when Unilever diverse their interest in the textile section. After a few years she moved on to become the head of administration and legal services for the Export Development and Investment Fund which is now the EXIMBANK, responsible for operationalising the export development and investment fund.